When we see a bartender with quick and confident gestures prepare one espresso after another, we may get the impression that preparing a good espresso is easy and a task essentially within everyone's reach. However, behind those almost mechanically-precise movements there is knowledge, study, skill and meticulousness. And especially cleanliness, accuracy and diligent care for the product and the machines used to prepare the espresso. There are many factors that affect the success of a good espresso and we now will examine all of them in detail. Even the most sophisticated technology and skilled bartender will not succeed in extracting a good espresso from a coffee of poor quality. The blend or quality must be pure and the coffee must be delicious, pleasant, sweet, fragrant, aromatic and leave a lasting and pleasant aftertaste. We ought to keep in mind that after drinking an espresso, a good rule of thumb for determining its quality is that it should leave us with the desire to enjoy another one. Within the dictates of local customs and tastes, coffee beans also must be roasted to perfection, because if the coffee is too dark it will taste bitter, while if it is too light it will taste overly acidic. Coffee beans last a long time in the original package (bag or can) but once opened, the product deteriorates rapidly. For its best storage, after we use the coffee, we should place it in a watertight container and store it in the fridge. The same technique can be used at home to store ground coffee, bearing in mind, however, that even if we apply these precautions, in a few days ground coffee will lose all its value. Remember that ground coffee is about 50 times more perishable than coffee beans, which is by how much the amount of the coffee’s surface exposed to atmospheric oxidation increases with ground coffee. The bartender should never store coffee from day to day in the coffee grinder. The coffee grinder/dispenser is the machine that helps grind the coffee and sample the perfect quantity for preparing a good espresso. A coffee grinder used in bars usually consists of two overlapping flat grinders, whose distance is adjustable to choose the right thickness of the ground powder. The grind should be adjusted several times a day because of frequent changes in humidity, especially in places where the climate changes often. Humid weather requires thicker coffee, or the coffee’s percolation will be slow and stunted and the product will be overly extracted. Dry weather instead requires finer ground coffee, or the extraction will "run-off" and the coffee will be insufficiently extracted and light. It is best to grind a little coffee at a time so that the product is always fresh. Grinders with flat burrs also turn at a high speed (about 1400 RPM) and their prolonged use will overheat the coffee, giving it an unpleasant smoky and burnt taste. Grinders need to be replaced roughly every 400 kg of coffee. The volumetric dispenser does not weigh the coffee, but dispenses a certain volume of it, which must be prepared and checked with care and with regular frequency. The ideal dose is about 7.5 grams per cup and 15 grams per two cups. Preparing two espressos at a time usually produces the best results. In the absence of sensitive scales, the dispenser is calibrated by weighing ten scoops and adjusting it to 7.5 grams. It is very important to clean the grinder, because coffee residues may go sour and spoil the product’s taste. In modern automatic espresso machines, the heart is the boiler in which water is heated. We ought to keep in mind that the water in the boiler is not used to prepare the coffee, but is tap water used for tea and other infusions. Steam forms at the top of the boiler which, through another tap on the machine, is used to heat milk and other liquids. Water used to prepare the coffee, supplied by a pump at a pressure of 9 bar (atmospheres) passes through a heat exchanger in the boiler where it is heated and maintained at the right temperature (about 90°C). To avoid drops in the water’s temperature, the unit to which the filter-holder is connected is in turn heated by a circulating water system. Once we have filled the dispenser, the coffee filter must be pressed by applying a force of 10-20 Kg. In principle, a skilled bartender will adjust the filter by pressing the coffee, in order to compensate for any minor differences of the grind. Before connecting the filter to the machine, the edge of the filter-holder should be cleaned thoroughly, as coffee residues could cause sealing problems (with a consequent loss of pressure) and form deposits on the gasket, in which case it will deteriorate more quickly. 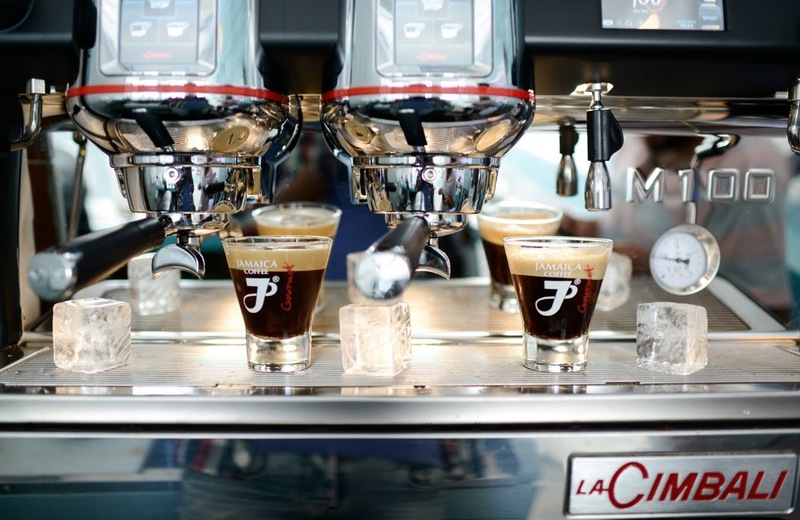 The extraction time varies between 20 seconds for a “ristretto” and 40 for a “caffè lungo”. The quantity in the cup will accordingly range between 20 and 40 ml. The coffee must pour out smoothly through a jet that is shaped like a "rat tail". Needless to say, the underside of the cup must be cleaned before placing it on the saucer. The cup should be very hot (about 60°C), but not too hot to burn the lips. We have already looked at some routine maintenance tasks, but it is a good idea to run them over a second time. Most important of all, the machine has to be cleaned regularly and thoroughly. A dirty machine and grinder will not work properly, besides making a bad impression. The bell of the grinder must be emptied and washed regularly, removing all traces of grease. The inner part of the grinder should be carefully brushed to remove any debris. The dispenser must be emptied frequently and cleaned with a brush. In the evening, the filters and filter-holders should be removed from the machine, emptied and washed. The handle area should be carefully cleaned with a small metal brush. The cup-saucer tray should be emptied and washed. At night, bartenders usually prefer to leave the machine switched on, as this also helps avoid excessive limestone formations. To prevent limestone build-up, it is very important to regularly regenerate the softener’s resins and to replace them when they are worn out. Remember that limestone deposits restrict the passage of water, lower the temperature and are damaging to the extraction process. There are various methods for classifying coffee, each of which takes into consideration certain elements that characterise the product and respond to practical purposes. This type of classification indicates the country of origin, the production area and is sometimes named after the port from which the coffee is shipped (as is the case for coffee classified as Santos). After the enforcement of the International Coffee Agreement, coffee varieties are grouped into three major categories: MILDS (English term accepted virtually all over the world), ROBUSTA and BRAZILIAN. MILDS: this category includes all fine Arabica coffee grown in Central and South America (and therefore excludes natural Brazilian coffee varieties). MILDS also include good-quality washed Arabica coffee varieties produced in Kenya, Tanzania, Burundi and Congo. These coffee varieties, which are produced exclusively by wet process, are for the most part named after the Country in which they are produced (Mexico, Guatemala, Colombia, etc.). Sometimes they are classified by their production area, such as Medellin and Armenia for Columbian coffee, or Coatepec and Huatusco for Mexican coffee. In some cases, the producer or the actual plantation is mentioned. Washed coffee, especially Central American varieties, are also classified according to the altitude of the production area. 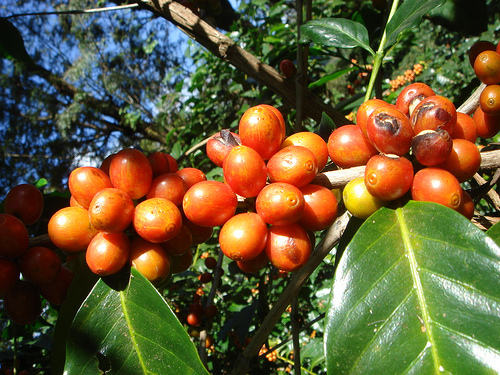 ROBUSTA: the country of origin and sometimes the region or shipping port are also indicated for Robusta coffee varieties grown largely in Africa and Asia. In addition to these, their description also specifies the grade (which matches the type), the sieve and whether the coffee is unwashed or washed. BRAZILIAN: this coffee accounts for roughly 30-40% of the global production and includes all the varieties grown in Brazil (Sao Paulo, Paranà, Sul de Minas, etc.). Commercially speaking, though, they are broken down into three main categories: Santos, Paranà and Rio/Minas, besides another category, Conilon, which consists of Robusta only. 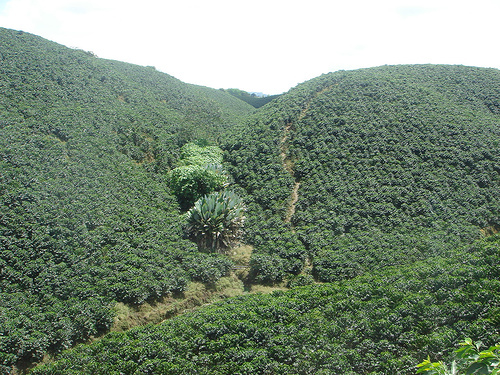 the production area (Triangle Mineiro, Sul de Minas, Cerrado, Mogiana, etc) is also often specified for Brazilian coffee. Trade descriptions often state the botanical species to which the coffee belongs, which nowadays is mostly ARABICA and ROBUSTA, as Liberica and Excelsa have basically disappeared and other botanical species like Arabusta are in the process of being tested and do not reach sufficient volumes to be considered a species of their own. The crop year is usually indicated as two years, i.e. 98-99, as the ICO coffee production year officially starts on 1 July of each year and ends on 30 June of the following year. The indication of the crop year is quite important, especially the period between two different harvests, and it is important to specify the year, as old coffee and newly harvested coffee have a different commercial value. The processing method is often referred to as washed (for coffee prepared by wet process) or unwashed (i.e. natural) for coffee prepared by dry process. Other processing methods include skinned, hand-picked, machine-cleaned and finally, the semi-washed method practised in Brazil, which is referred to as “descascado em cereja” (cherry pulped). FLAT BEAN - grana piatta, a volte allungata specialmente nella varietà Tipica. BOURBON - arabica di grana piatta, leggermente arrotondata alle estremità. PEATBERRY - grana piccola e rotondeggiante, presente sia nell'arabica che nel robusta. Una volta, in Italia, questo caffè veniva chiamato perla. Ora anche da noi è conosciuto come caracolito, mentre in Brasile viene denominato moka. MARAGOGYPE - grana piatta gigante con solco centrale irregolare. ROBUSTA - grana con faccia anteriore convessa ed estremità arrotondate, mentre quello indiano presenta pure grane con estremità appuntite. Il caffè indonesiano e vietnamita hanno spesso il solco irregolare e più aperto degli altri robusta. The bean’s thickness is measured using special sieves (strainers formed by drilled plates whose holes are measured in 64ths of an inch) that are identical to the sieves used by coffee machines when processing the product. We therefore might have an 18-sieve batch that will correspond to a coffee whose bean will be retained by a sieve with holes with a diameter of 18/64ths of an inch. For Asian coffee (grown especially in Indonesia, India and Viet Nam), the thickness of the bean is measured in millimetres and not in 64ths of an inch as is the custom in other producing countries. The TYPE of coffee is determined by the number of flaws and/or foreign bodies present in a batch such as: various impurities, beans that are broken, black, damaged, immature, burned, fermented etc. These imperfections are caused by the agricultural and industrial method used to process the product. Depending on the greater or lesser percentage of flaws found in a sample of 300 grams, which is representative of a given batch, the coffee is assigned a different commercial value. The colour can be very important to experts, as it indicates whether the crop is current, past or old, and experts can draw valuable information on the composition of a given batch based on the coffee’s colour. Only after roasting coffee is it possible to inspect its intrinsic quality more accurately, because the roasting process considerably changes the coffee’s chemical structure and highlights a set of organoleptic properties that would otherwise go unnoticed. Coffee roasting is also used to define the aromatic principles, which are extremely useful in assessing the coffee’s quality. The odoriferous properties picked up by our sense of smell, especially by that of an expert taster, are essential. Some of the positive or negative characteristics of coffee most easily identifiable by our sense of smell are: floral, chocolatey, spicy, fermented, green, earthy, stinker, woody, baggy, smoky, fruity, winey, leathery, Rioy or Rio (carbolic acid). When assessing the taste in the cup, the most widely used methodologies and terminologies are those of Brazil, which are also used on the New York Stock Exchange. The main terms used to define the taste are: Strictly soft, Soft, Softish, Hard, Rioy, Rio. The quality of an espresso we drink at a bar depends on several factors: the blend used to prepare it, the correct grinding, the machine’s level of calibration and the "skilled hand" of the bartender who prepares the beverage for instance. The coffee used in the blends is usually the "Arabica" or "Robusta" variety. The qualities of Arabica are: a sweet and penetrating taste, an intense and harmonious flavour, a medium body, thin, light brown-reddish striped, bubbly foam and a caffeine content between 1.2 and 1.5%. 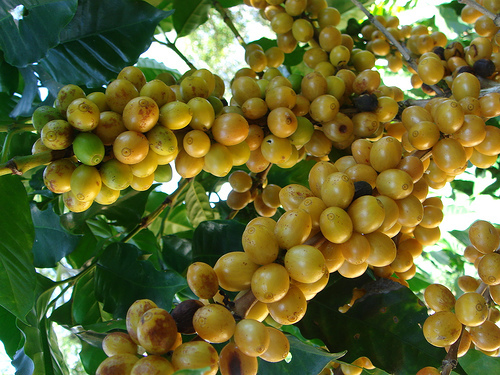 The Robusta species, instead, has a bitter taste, often woody or astringent, a weak aroma, a full body, a thick and often brown-greyish, bubbly foam and a caffeine content between 1.8 and 4%. The best coffee blends are those that contain only the finest Arabica. – The coffee can should never be stored alongside other strong-smelling products (such as cheese, cold cuts or teas), because coffee tends to absorb the odours around it and this obviously alters its taste. The most important ingredient of all is...courteousness. "Enjoying" an espresso at the bar is for most people a time for taking a "break" from the stress and hectic pace of their daily lives. And that is why one of the key ingredients of a "good espresso", besides the product’s quality, is the bartender’s courteousness. Exchanging a few care-free words or just simply serving customers with a smile gives them a pleasant feeling and makes them feel welcome, which is what they are looking for in that moment and which really should come effortlessly to the bartender. There is no doubt that a friendly and approachable bartender is sure to make a lot of customers who in turn are more than glad to make his Bar “their” bar of choice, knowing that they will always get the service they expect.